These letters were recently revealed on the DVD release of This Is Your Life. Although commonly accepted that the boys (especially Stan) did not enjoy the experience of the show, these letters indicate otherwise. 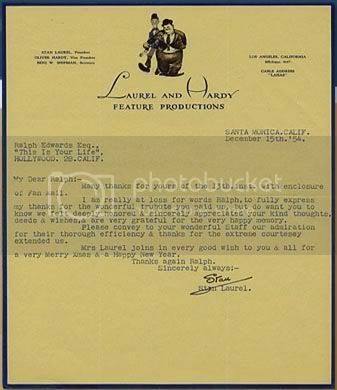 If Laurel and Hardy were less than thrilled about appearing on the program, the notes penned to host Ralph Edwards afterward indicate their immaculate professionalism. Many thanks for yours of the 13th. inst. with enclosure of Fan Mail. I am really at loss for words Ralph, to fully express my thanks for the wonderful tribute you paid us, but do want you to know we felt deeply honored & sincerely appreciated your kind thoughts, deeds & wishes, & are very grateful for the very happy memory. This is a belated thank you for the reason that I am still floating on a cloud from experiencing one of the most thrilling moments of my life. I have never before and never expect again to have such a thrill as I had appearing on “This Is Your Life”. I would also like to take this opportunity to thank you and your associates for the wonderful treatment accorded us during and after the performance. May I also wish Mrs. Edwards and yourself, as well as all of the members of your organization, Mrs. Hardy’s and my best wishes for a very Merry Christmas and Happy and Prosperous New Year. Stan Laurel was surely a paradox. He griped forever about his lack of participation in his 20th Century-Fox films, yet Scott MacGillivray’s bio shows that Laurel was allowed more and more input into the movies as they went along. Laurel wrote to one L&H buff about how terrible The Big Noise was, yet he confided to a friend that he actually somewhat liked it. No matter what his true opinion on his and Babe’s appearance on This Is Your Life, surely his sense of professionalism would allow him nothing less than a polite thanks to the host. A very classy act, indeed. Stan certainly was professional and classy. I’ll argue the description of “paradox” is too strong though. He could be of two minds about things simply and justifiably as all of us are at times. I think Stan was genuinely shocked, and also ambivalent about the “This Is Your Life” program during its course, since he may have wished for, or been planning, a different sort of television debut for the team. He was polite but reticent on camera. He can’t have been altogether unhappy with “This Is Your Life.” His and Babe’s families helped to plan it, after all, and fans were delighted as he came to learn. So I suspect that, all in all, he came to appreciate the tribute genuinely. As to the late films, Stan recognized as we all do, that none of them lacks for good moments, while the films are in general of markedly lower calibre (a description Stan himself also used in this context) to those that came before. “The Big Noise” in particular gets highly disparate fan reactions to this day. Personally I’ve more or less enjoyed it, or generally loathed it, upon various viewings over the years. It’s fair to say that, regarding the late movies, and taking these either individually or collectively, both Stan and Ollie seemingly felt similarly as most fans do today. The post-1940 product comes in a mixed bag, not of those good old hard-boiled eggs and nuts, but of nice nuggets amongst larger lemons. Wonderful to read their letters from their experience on This is your Life. They really were perfect gentlemen. I don’t know if Stan Laurel was a paradox, but let’s say that he was a complex man. To be a performing artist and also be directly involved in the filmmaking process (at least before 1941), one would have to have a fairly complex personality. I believe that these letters reveal more about the gracious nature and professionalism of the two men, than any real pleasure in having been put on national television without any prior notice. Stan was always uncomfortable about that TV appearance. Probably this was mostly because since this was a surprise, he was unable to prepare for it. Being a lifelong performer, it would be his nature to want to be fully prepared for anything he did in front of any camera, whether it be for a film or for televsion. Even though Laurel and Hardy usually didn’t have what would be called “proper” rehearsals for the many films they made as a team from 1927-40 (in order to maintain spontenaity), they would always at least discuss ahead of time what they would basically do, so that they were mentally prepared for the scene they would perform. This Is Your Life was something suddenly sprung upon them, so they literally had no idea what to say or do. Even though it wasn’t a situation of acting out a fictional scene, Stan still would have preferred to have been able to prepare himself in his mind ahead of time for what was to be his first appearance on television. 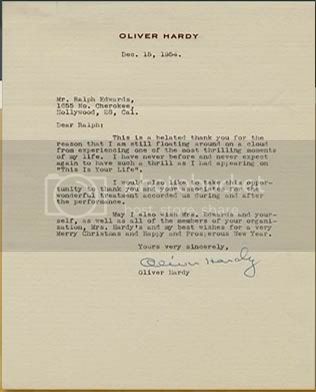 Babe Hardy seemed to enjoy it somewhat (or at least excersized his acting ability on this appearance). He even made a few comments during the program, while Stan hardly said a word. Stan was certainly uncomfortable, and understandably so, as it was his first appearance on television, he was taken by surprise and therefore, was gobsmacked, lost for words, would’nt anybody be ? I think he handled it rather well under the circumstances, and was belatedly appreciative. so what about Ollie ? Well, Ollie was Ollie, and took it all in his stride: literally, he did’nt even rush to go two blocks away to where Ralph Edwards was waiting, he finished his drink first. To sum it all up; If Ralph Edwards had let either of them get a word in edgeways, They might have had more to say.